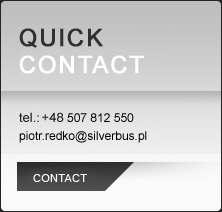 Welcome to the website of Silverbus. We specialize in passenger transport services. We stand for safety, comfort and reliability. 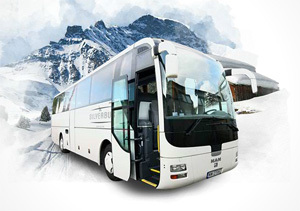 Our transportation fleet consists of the following models: MAN Lion Coach, Setra S 315 HD, Mercedes O350 SHD, Mercedes Tourismo L 17 RHD, Mercedes Atego, and Mercedes Sprinter. Our buses are clean, in good working order, and meticulously cared for. They are equipped with television, bathrooms, minibars, fridges, air-conditioning and reclining seats, all of which make a coach travel comfortable. We employ highly experienced and qualified drivers, who meet a wide range of requirements and must pass new strict carrier regulations. We offer flexible rates to our clients, which include travel agencies. We help organize a wide range of events, such as school trips, and many others. Thanks to our certificates and licenses, we provide a variety of tourist services including trips to domestic and foreign (European) destinations.